On June 11, 1995, the 22,392 fans on hand to watch the Montreal Expos battle the San Francisco Giants for 13 innings at Candlestick Park saw it all: lots of runs by both sides, the home side making a seemingly impossible comeback only to blow it in extra innings, and a player hitting for the cycle to boot. The two clubs combined for 18 runs, 36 hits, and 11 bases on balls, with the Expos emerging victorious. 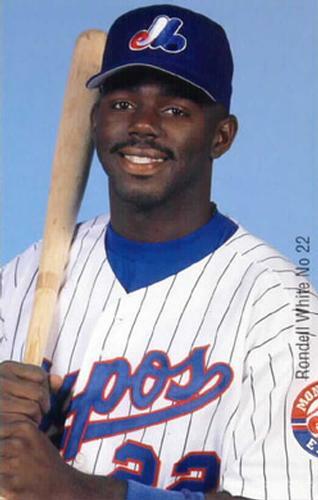 Rondell White, Montreal’s center fielder, headlined the show by hitting for the cycle. Second-year pitcher William VanLandingham was making his second start of the season for the Giants. His ERA was 1.29 when the game began, but a whole lot higher by the time he left. Opposing him was veteran Gil Heredia for the Expos, who brought a 5.11 earned-run average to the contest. The excitement started in the top of the second inning when White led off with a single to center field. On the very next pitch, Tony Tarasco doubled to center, sending White to third. Darrin Fletcher followed with a home run deep down the right-field line, and Montreal suddenly had a 3-0 lead. After the home run, VanLandingham settled down to retire the side, and even appeared to have found a groove when he worked a three-up, three-down third inning. Manwaring led off the bottom of the fifth with a single, moved to second on a sacrifice by Barton, and scored on Darren Lewis’s single. Lewis stole second and scored on Mike Benjamin’s single. Benjamin also stole second, and scored on Glenallen Hill’s double to center, cutting the Giants’ deficit to 7-3. The Expos added a run on three hits in the top of the seventh. White led off with his second double of the game, moved to third on a single by Tarasco, and scored on Fletcher’s single. San Francisco answered in the bottom of the seventh with two-out singles by Benjamin, Barry Bonds, and Hill. Benjamin’s run made it 8-4. Jeff Shaw replaced Heredia after Bonds’ hit, and gave up Hill’s single; Heredia was charged with the run. San Francisco put together a gutsy comeback in the bottom of the ninth against Expos closer Mel Rojas. Benjamin led off with a line-drive single to center field. Bonds walked. Hill sent a line drive to deep left field for a double to score Benjamin, with Bonds going to third. Royce Clayton grounded out to shortstop, but got the RBI when Bonds came home. John Patterson, who had entered the game as a defensive replacement for Robby Thompson at second base in the sixth inning, fouled out to first baseman Segui. With two outs and two strikes, J.R. Phillips singled up the middle to score Hill, and suddenly Montreal’s lead was down to one run, 8-7. Rojas now could not find the strike zone. With a 1-and-0 count, RikkertFaneyte singled deep into the left-center-field gap, advancing Phillips to third base. Jeff Reed, who had replaced Manwaring in the seventh, walked on four pitches to load the bases. Tom Lampkin pinch-hit and also walked on four straight pitches, which brought Phillips in with the tying run.Alou replaced RojaswithGreg Harris, who got Benjamin to ground into a short-to-second force out to end the inning. Neither team scored in the 10th, 11th, or 12th. White made some noise when he singled and stole second in the top of the 11th, but was stranded. Steve Mintz, the seventh Giants pitcher – he came on in the 12th– started the top of the 13th by quickly retiring Cordero and Frazier on three pitches.Then, on a 3-and-1 count, White drove the ball down the right-field line for a triple and the cycle. Mintz walked Tarasco intentionally, then gave up a two-run triple to Tim Laker, who had replaced Fletcher in the seventh. Mintz walked Sean Berry and retired Shane Andrews, but the damage was done. The Giants went quietly in the bottom half of the inning against Gabe White, the Expos’ sixth pitcher of the game, and the Expos had won, 10-8, in just over 4½ hours. White had six hits in seven at-bats. He achieved the fourth cycle in Expos history (preceded by Tim Foli on April 22, 1976, Chris Speier on July 20, 1978, and Tim Raines on August 16, 1987). He had two singles, two doubles, the extra-inning triple, and a home run. He had a chance to complete the cycle in regulation, but he popped out in the top of the ninth. White actually had ideas about trying for the triple in the seventh inning. “I felt I had a chance,” he said after the game. “But I’m still a little sore in my hamstring and I didn’t want to take the risk.”2 What was different in the 13th inning? The drive off White’s bat was a dying liner that right fielder Glenallen Hill could not put a glove on, which allowed White to reach third base easily. The whole team quite likely enjoyed the flight home. The victory over the Giants gave the Expos their first three-game series sweep at Candlestick Park in 11 years.4 In the three games, White was 11-for-16 with a walk, and scored 10 runs for Montreal. His average rocketed from .299 coming to San Francisco to .373 after the series, and his slugging percentage leaped from .612 to .747. 1 VanLandingham finished the year with a respectable 3.67 ERA. 2 Jeff Blair, “A White Christmas for Run-dell; Expos blow lead, then bury Giants,” The Gazette (Montreal), June 12, 1995. 4 According to Blair, the Expos’ previous sweep of the Giants at Candlestick Park occurred on August 16-18, 1984.